The Tax Cuts & Jobs Act passed on December 20, 2017 impacts nearly every taxpayer across the financial spectrum – from individuals and families to corporations, pass-through entities and estates. These reforms will affect upcoming tax planning and preparation for the 2019 tax return season. Guest speaker: Peter Greendyke, CPA, Partner, Greendyke, Jencik & Associates CPAS, PLLC. Note: Seating is limited at this event. 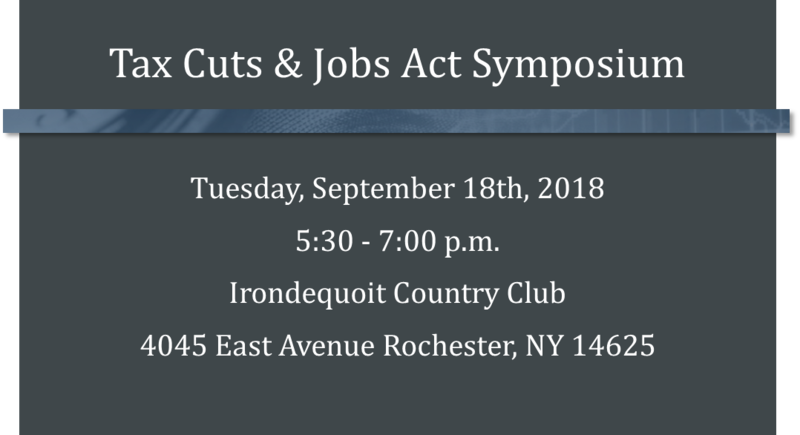 Please RSVP by no later than September 10, 2018. Yes, I/we plan to attend the meeting in person. Yes, I/we plan to attend virtually via Skype for Business. Yes, I/we plan to attend virtually via Facebook Live. No, I/we cannot attend at this time but I would like to have summary materials emailed to me. Yes, I/we look forward to attending. Yes, I/we plan to attend virtually via Skype.